Amir Khan says a rematch with Lamont Peterson is "99 per cent there", although the Brit has warned his rival he will "not wait too long" for him to put pen to paper because he does not want to get ring rusty. Khan is pushing for a second fight with the man who beat him in controversial circumstances in Washington in December. 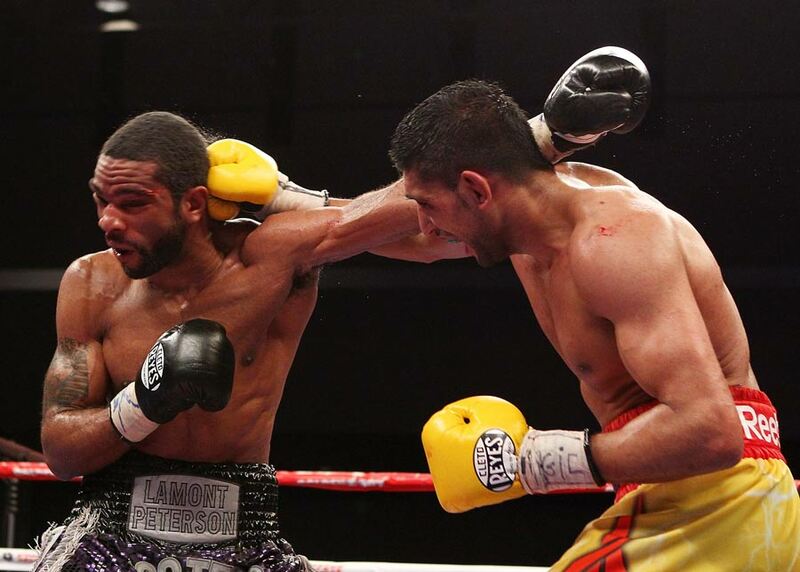 Peterson edged a titanic battle on a split decision, after Khan had been docked two points by the referee for pushing. The result was called into question when Khan raised concerns over a mystery figure - Mustafa Ameen - was spotted handling the judges' scorecards ringside during the bout. The saga has rumbled on, with the former WBA and IBF champion reaffirming his desire for another crack at Peterson, although he has stated a return fight would not take place in Washington. Khan appealed the outcome and the WBA has since ordered a rematch between the pair and, although Peterson has still not signed on the dotted line, Khan is confident he will get another chance against the man who inflicted the second defeat of his professional career. "We're very close now," he said. "We put an appeal in because we wanted a rematch; we felt we deserved a rematch because in the fight there was so much going on. "We're literally now 99 per cent there. The contract has been signed from my side. I've sent them off to Lamont Peterson and his team. Hopefully he can sign it, then we can get the fight on. "It was a great fight - and I'm not taking anything away from Lamont Peterson, he's a great fighter - but I think I deserve a rematch." Although Khan is eager to get Peterson back in the ring, the 25-year-old Bolton-born fighter says he has alternative plans bubbling in the background in case a deal for a rematch cannot be reached. "We sent them (the contracts) off a long time ago," he added. "I think the reason for the delay is because he knows he would get beaten. He wants to probably hold on to the titles and have a few more defences to make a bit more money. "But the deal that we have offered him...we've offered him a massive deal, but he's not responded back. If they don't want to take the fight then I will just move on. I'll probably move up a division at 147lbs. There are a few names we're looking at there. "I'm not going to be waiting too long because I want to stay active. I think the whole world knows we've put the fight to Lamont Peterson, it's up to him to take it. "We've given him an amazing deal, we've offered him 50 per cent of the world revenue, whereas before he got a lot less when he fought me the first time. I want this fight again, I want to prove I won the first fight and I'll prove it in the second fight by knocking him out."